We are proud to announce our suppiier Veronica Foods and their exclusive partnership with a third generation, family owned and operated Spanish table olive producer that shares their vision for the strictest quality criteria. Their partner selects and cures only the finest quality, handpicked, early harvest olives from the south and south-east of Spain. Their family recipe for low salt brines coupled with triple wash and soak methods results in olives that are not only lower in salt content but also naturally crunchy with a clean savory flavor and meaty texture. Most of the products in our new olive collection are comprised of the rare Gordal olive. These olives are massive. In fact, the name “Gordal” literally translates to “the fat one” in Spanish. The Gordal’s low oil content, firm, meaty texture, and mild savory flavor make it a true rare delicacy among table olives. Our product is handpicked and stuffed in Spain. Manzanillo Olives with Rosemary and Garlic: Sweet garlic cloves and fresh rosemary delight but do not overwhelm the savory flavor of these meaty, firm Manzanillo olives. Whole Gordal Olives with Pits: Our Gordal with pits have an even firmer texture. Their low oil content, meatiness, and mild savory flavor make them a true, rare delicacy among table olives. La Abuela Mix ( translates to: Grandmother’s Recipe): Julienne cut Spanish onions, savory herbs, and sweet Spanish garlic form a zesty marinade for meaty Gordal olives in this uniquely satisfying mix. Manzanillo Stuffed with Spanish Almonds: Crunchy Spanish almonds are hand stuffed into firm, meaty Manzanillo olives. Insanely delicious!!! Manzanillo Suffed with Lemon : Real lemon pieces are hand stuffed into firm, meaty Manzanillo olives. A delicious lemon flavor. Great for drinks. Spicy Green Piri-Piri Chili Stuffed Gordal: Medium-hot green Piri-Piri chilies are hand stuffed into meaty, savory Gordal olives. Caution! Medium-Spicy! Gordal Stuffed with Sweet Spanish Garlic: Meaty Gordal are hand stuffed with sweet Spanish Garlic cloves. This zesty-savory combination is a real crowd pleaser! 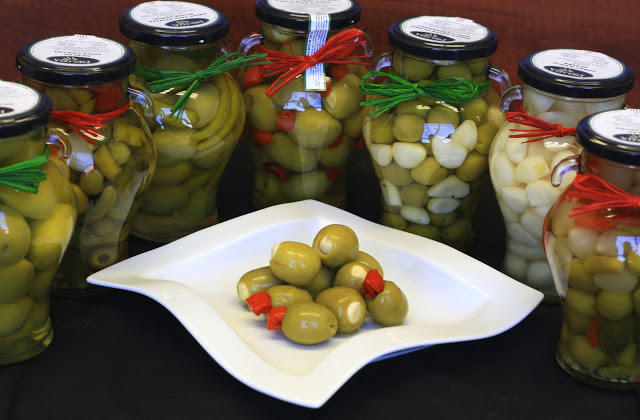 Medium Spicy Mix : This classic Spanish olive/pickle typically served as tapas includes small Spanish pearl onions, firm meaty Manzanillo olives, spicy red Piri-Piri chilies, medium-hot green Piri-Piri chilies, and tiny crunchy Gherkin pickles.